7. Airbrush Ma­keup Ar­tist Schaum­burg Na­per­vil­le Auro­ra /airbrush-makeup-artist-schaum­burg-na­per­vil­le-auror..
8. Profes­sio­nal Bri­dal Ma­keup Ar­tist Schaum­burg Palati­ne Ar­lington Heights /profes­sio­nal-bridal-makeup-artist-schaum­burg-palat.. The web server used by Chicagomakeupartist.net is located near the city of Provo, USA and is run by Unified Layer. This web server runs a few other websites, mostly in the english language. 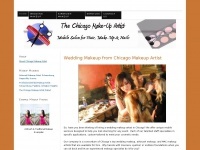 The websites of Chicagomakeupartist.net are served by a Nginx server. The website does not specify details about the inclusion of its content in search engines. For this reason the content will be included by search engines.